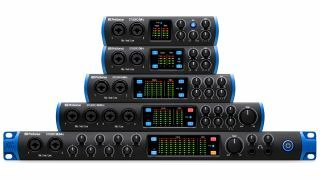 NAMM 2019: PreSonus has updated its Studio series of audio interfaces with five new USB-C models. The 24c, 26c, 68c, 1810c and 1824c all offer 24-bit/192kHz performance and ship with both USB-C to USB-C and USB-C to USB-A cables. As such, they should be compatible with the majority of computers. As you’d expect, each interface has a different use case. The Studio 24c is a 2-in/2-out model that’s designed for fairly straightforward home and mobile recording, while the 2-in/4-out 26c could be a good bet for DJs and other electronic musicians. The Studio 68c’s additional I/O - it’s a 6-in/6-out device - makes it suitable for small bands and studios, while the 1810c, with its 18 inputs, gives you even more flexibility. Finally, the 1824c is for those who demand a serious level of connectivity - in order to mic up a drumkit, perhaps. All the Studio Series USB-C audio interfaces are available right now, with expected street prices as follows: Studio 24c $149.95; Studio 26c $199; Studio 68c $299; Studio 1810c $399.95; Studio 1824c $499.95. Find out more on the PreSonus website.